Particle physics is one of the most interesting fields in physics. Although there are many different particles already, researchers continue to postulate new and exciting particles. Most of these new particles are tied into the research of dark matter and dark energy, and physicists are currently trying their best to discover them. In the early 20th century, Albert Einstein introduced cutting-edge physics about black holes, which his theory of general relativity supported. Among his most interesting work was the theory of a black hole electron. Black holes can come in various shapes and sizes depending on how they form. Einstein’s black hole electron was a purposed black hole that had the same size and mass as an electron. 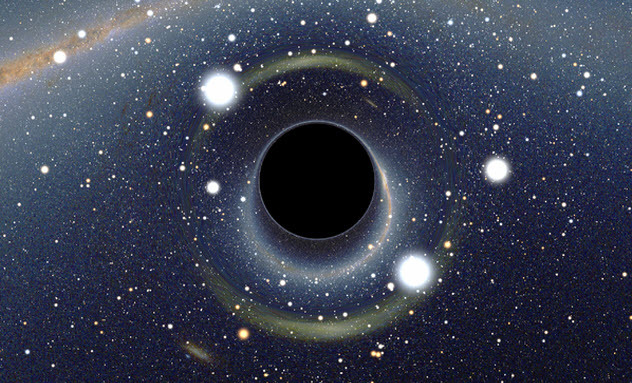 In Einstein’s papers, he discussed what this tiny black hole would look like. Oddly enough, it would experience the same magnetic properties as a normal electron. If somebody ever observed a black hole electron, it would look just like a normal electron. Beyond that, the black hole electron would be relatively stable and remain the size of an electron throughout its life. Einstein’s work on the black hole electron did not become a mainstream part of particle physics in his day, but recent innovations in string theory are returning it to the forefront. Modern string theorists have constructed models that consider particles as miniature black holes. These models help solve computational problems that exist in normal physics, so it is possible that Einstein was not too far off the mark. 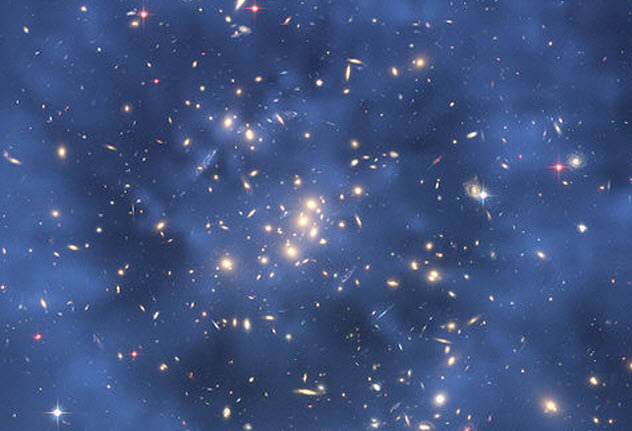 Dark matter research is one of the most discussed fields in modern particle physics. Nobody knows exactly what dark matter is, and physicists constantly propose new candidates for this elusive substance. In 2008, a team of researchers proposed a new type of subatomic particle called the dark photon. This particle would seem like a normal photon but would only interact with dark matter. The dark photon is the proposed force carrier for the electromagnetic force between dark matter. Instead of relying on the normal photon as the force carrier, researchers proposed that the dark photon is what carries the interaction. To explain why dark matter is invisible to observation, physicists speculated that another fundamental force is acting on dark matter. This “dark electromagnetism” is a long-range gauge force but is only mediated by the dark photon. As odd as this may seem, particle researchers had reason to believe that dark photons existed. In the early 2000s, researchers carried out an experiment named g-2. This experiment tried to measure muon (another type of subatomic particle) spin “wobbles” as they passed through a magnetic field. During the experiment, the muon wobbles did not work out to what the standard model predicted. Further experiments were conducted at particle accelerators to see if the anomalous readings could be the sign of dark photons. Unfortunately, the results showed that dark photons are not the culprit. Something else is. The g-2 anomaly has not been solved yet, although researchers are sure that dark photons are not to blame. Still, dark photons are not impossible. They may exist in our universe. Although dark matter is a huge mystery in physics, dark energy is an even bigger one. All measurements and models show that the universe is not only expanding, it is accelerating at an increasing rate. Physicists do not know what is causing the acceleration, and countless researchers are proposing various explanations for the “dark energy” that is creating our expanding universe. One of the most interesting ideas is the chameleon particle. In theory, the chameleon particle would mediate a fifth field in our universe called the chameleon field. The particle for this field has a variety of odd properties. Researchers propose that it has a variable effective mass that changes with the density of the region of space it inhabits. The bigger the effective mass, the more force it exerts. For example, in our solar system, the chameleon particle would be undetectable because the high relative density of our solar system would make the particle exert an extremely weak force. But in intergalactic space, which is almost empty, the chameleon particle would be extremely strong because the density is so low. This proposal explains why scientists see universal expansion. However, scientists want to detect the particle. But it’s difficult because scientists are on Earth in a dense part of the universe where the chameleon force would be extremely weak. A team at Berkeley built an experimental apparatus to detect chameleon particles. Although the test was inconclusive, it did not rule out the existence of chameleon particles. So scientists are working on more experiments and instruments to detect these elusive particles and discover the nature of dark energy. Another candidate for dark matter is the sterile neutrino. Normal neutrinos are extremely weakly interacting particles formed in various nuclear reactions. The three types of neutrinos in the standard model are well understood. They are so weakly interacting that scientists refer to them as ghost particles. Sterile neutrinos are different because they only interact via the gravitational force. Normal neutrinos (aka active neutrinos) receive charge from the weak force, but sterile neutrinos are completely uninfluenced by any of the subatomic forces in the standard model. They are ghosts of the ghost particle. Sterile neutrinos are a possible candidate for dark matter. They are interesting because they exist outside the standard model of particle physics by adding more neutrinos to the three that scientists already know. If discovered, sterile neutrinos would force scientists to rearrange parts of the standard model. As for dark matter, physicists are still on the fence about whether these ghostly particles are a good candidate for it. But recent discoveries have provided evidence that sterile neutrinos might exist. The problem is that sterile neutrinos are extremely difficult to detect because they barely interact with other forms of matter. Scientists have a difficult time detecting their active cousins, much less the sterile versions. In 2014, astronomers detected odd X-ray emission lines from a nearby galaxy that fit within the sterile neutrino theory. Using this data, astrophysicist Kevork Abazajian showed that the sterile neutrino model could explain the structure of other nearby galaxies. This discovery is the best current evidence of sterile neutrinos because the underground detectors for active neutrinos have not had any luck picking up signatures of this ghostly particle. Of all the candidates that scientists have proposed for cold dark matter, the axion is getting the most publicity and interest. The axion was first proposed to solve a tricky problem involving the strong nuclear force. In standard model mathematics, particle physicists include certain input variables to make the math work. However, one variable has a value of nearly zero, making it unobservable. When physicists plugged that value into their equations, it showed that one of the fundamental quarks would be massless. Observation of quarks contradicted this model, so scientists came up with a new field and particle to fix the situation. This particle is the axion. It has an extremely low mass, close to one-trillionth of the mass of an electron. Also, axions only weakly interact with other matter but have odd and special interactions with the strong nuclear force. In theory, these particles are completely transparent to light and do not interact with matter according to standard model. All of this makes the axion a key candidate for dark matter. The other leading theory is the WIMP (weakly interacting massive particle) model, which proposes new particles that are much heavier than the proton and neutron. Axion models have an advantage over the WIMPs in that they are already a part of quantum theory. Cosmological theories state that axions could make up 85 percent of the dark matter in our universe. The rest would be other particles. Scientists are conducting experiments to find these invisible particles, but the search is not easy. The dilaton is a weird particle proposed by string theory. When string theorists work with the Kaluza-Klein compactification theories, the dilaton is a particle that has to exist. But it causes the fundamental constants in nature to fluctuate. Instead of our universe having constants like Newton’s constant or the Planck constant, the dilaton would have allowed these numbers to fluctuate during the early universe. After that, the dilaton would have frozen in value, which also caused the values of the fundamental constants to freeze. Dilatons might seem strange, but they are critical to understanding string theory cosmology. String theory relies on the Kaluza-Klein theories, and there is no way to ignore the dilaton in those theories. In fact, physicists believe that the dilaton is a fundamental scalar in our universe, meaning that it is impossible to ignore it if it does exist. However, experiments to detect the dilaton would be extremely difficult to conduct. But its properties perfectly match the properties of dark energy. So if string theory is correct, the dilaton could solve the persistent mystery of dark energy. One of the biggest mysteries of big bang cosmology is the inflationary period of the universe. In the split second after the big bang commenced, the universe experienced exponential growth. Eventually, that quick growth tapered off into the expansion rate observed today. This inflationary period has allowed scientists to observe the cosmic background microwave radiation and other interesting features of the universe. However, nobody knows why the universe experienced inflationary expansion or why it stopped. The inflaton is a proposed field that would explain why the universe expanded like it did. Like every field, the inflaton has a particle associated with it (also called the inflaton). The inflaton worked in a few basic steps. At the beginning of the universe, it was in a high-energy state and experienced random quantum fluctuations as expected from the superdense infant universe. Eventually, the inflaton settled into a low-energy state, which triggered a massive repulsive force that allowed the inflaton to return to its high-energy state. Strangely, the inflaton does not exert this repulsive force when it has high energy. Inflaton theories may seem elegant, but they are still hotly debated among physicists because the inflationary model has not been accepted by all scientists. However, new theories surrounding the early universe show that the inflaton field is a good candidate to describe how our universe came to look like it does. Some researchers believe that the recently discovered Higgs boson is the inflaton particle for which they have been searching. Possibly, these two particles are the same thing. Proposed by a team led by James Bateman, this unnamed particle is another candidate for a superlight dark matter particle. Bateman’s particle is much heavier than the axion but still only a fraction of the mass of an electron. Like other dark matter candidates, the new particle would be completely invisible because it would not interact with light. However, it would interact with normal matter, explaining some of the anomalies around dark matter. An interesting feature of this new particle is that its interaction with normal matter is only effective over long ranges or in strong gravitational fields. Thus, the new particle would be totally unaffected by Earth. Bateman believes that his particle would be able to travel through Earth and its atmosphere without bumping into other particles or being detectable because it has such a small mass. Millions of Bateman particles could be flowing through you right now. If the particle is real, it would show that dark matter permeates space much more than previously believed. However, this unnamed particle is so weakly interacting that it is extremely difficult to design an experiment that would detect it. Right now, the verdict is still out on the existence of the Bateman particle. Until there are better experiments, the Bateman particle will simply remain an interesting possibility. A key value in quantum mechanics, the Compton wavelength is a characteristic of a particle that is dependent on its mass and shows its relationship to energize photons. If the Compton wavelength of a particle is equal to its Schwarzschild radius, it is a Planck particle. The Schwarzschild radius shows how far you can compress an object before gravity overwhelms the other physical forces in the universe and creates a black hole. At that size, the escape velocity from the surface of the object would be greater than the speed of light, which is the defining characteristic of a black hole. Thus, Planck particles are so compact that they have turned into black holes. Planck particles have characteristics equal to the Planck constants for mass and size. A particle of this nature would weigh as much as the Planck mass (1019 times the proton’s mass) and be extremely small (10-20 times the proton’s diameter). This makes the Planck particle extremely dense. These weird particles are interesting to physicists. At first, they were just introduced in equations as a way to work out the dimensions of the result. Now they are interesting because they may hold the key to making quantum mechanics and general relativity work together. Cosmologists are also interested in Planck particles because they might have existed in great abundance in the early universe. By including the Planck particle in cosmological models, researchers have been able to determine that the early decay of Planck particles may have resulted in the observed properties of the particles in our era of the universe. Most people are familiar with the idea of an antiparticle, which has the opposite charge of its normal companion. For example, an electron has a -1 charge and its antiparticle, the positron, has a +1 charge. Theoretical physicists have expanded this idea to mass and postulated a new set of particles that have the opposite mass of our normal particles. This is a pretty strange concept. If you had a mass of 1 kilogram, the same amount of negative matter would be -1 kilogram. Antiparticles have positive masses but opposite charges. Negative matter is in a league of its own. If negative matter does exist, it would help to solve some of the most interesting problems in physics. For example, it would lead to uniting general relativity and quantum mechanics. Physicists research negative matter because it would allow humans to discover ways to travel the universe. General relativity states that negative matter would repel all other matter, both negative and positive. Thus, if negative matter could be harnessed, it would allow humans to stretch space-time and possibly open wormholes through which ships could travel. Researchers also conduct negative mass research because it may help us to understand the arrow of time and some of the more confusing concepts about black holes. Negative matter could also be used to create a plasma that would absorb gravity waves. Unfortunately, creating negative matter is a long way off, but it is clear that these new subatomic particles could revolutionize science and space travel. Zachery Brasier is a physics student who likes to write on the side. Check out his personal blog at zacherybrasier.com.